You know those ”Parental advisory – explicit lyrics” guidelines stamped on loads of hip-hop records? Well, you probably do. A version of that should be on every Chezidek album. It should read ”Extremely fragile – handle with care”. This is because of Chezidek’s voice. It’s high and instantly recognizable, but fragile as a vase. His second album this year – following the mighty The Order of Melchezedik – is Freedom Fighters, a 15 track set sneaked out below the radar about a month ago. It’s produced by Andrew ”Bassie” Campbell and One Drop Records, a label responsible for last year’s Hold the Vibes by Ras Attitude and Truly from Lutan Fyah. Chezidek has a voice that may take a while to fully appreciate and he may not always be pitch perfect, bu he usually gets his hands on strong material and he also has a feel in his voice that many singers should envy. He sings from his heart and soul about political corruption (Mr. Corruption), increasing violence (Eye Watas & Prayers) and the environment (Chemical Free). The latter is one of his favorite topics and has over the years rendered several strong environment anthems, including Leave the Trees and Plant a Tree. Freedom Fighters contains enough strong number to be interesting for any fan of rootsy, cultural and conscious reggae. The first six months of 2013 have offered a number of glorious albums from Jamaican, U.S. and European artists and producers. My 15 favorites are listed below and if you’re curious about how it sounds you’re more than welcome to check the accompanying Spotify playlist here, where a majority of the releases are included. You can also check a review of each album by clicking the link to the set. The list includes no reissues and is in no particular order. Captain Sinbad – Reggae Music Will Mad Unu! This veteran deejay made his musical comeback for Frenchie more than 20 years after his latest release. The LP and the version for digital platforms have different track lists, and I suggest you check out the vinyl version. The sweet high tenor voice courtesy of Cornel Campbell is set to magnificent music from the highly talented production trio Zion I Kings. German singer Jahcoustix wanted to make a more diverse album, but Frequency is his most consistent and cohesive set yet. Gruff voiced pioneering deejay Trinity teamed-up with Irie Ites for this retro sounding musical feast. High school teacher by day and singer by night. Judging by this wonderful album Malika Madremana should focus on her music. Bob Marley-sounding Meta Dia moved from his home country Senegal to New York City and was exposed to an array of musical styles. His second album is roots reggae at its finest. Best album yet from this reliable U.S. deejay. Rising star on the European and global reggae scene that has managed to make a catchy album full of foundation vibes. 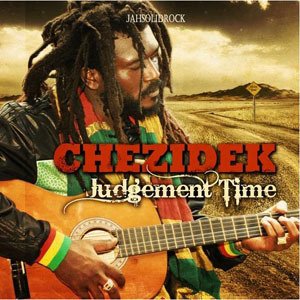 In 2010 Chezidek teamed-up with Dutch label JahSolidRock for his critically acclaimed album Judgement Time. 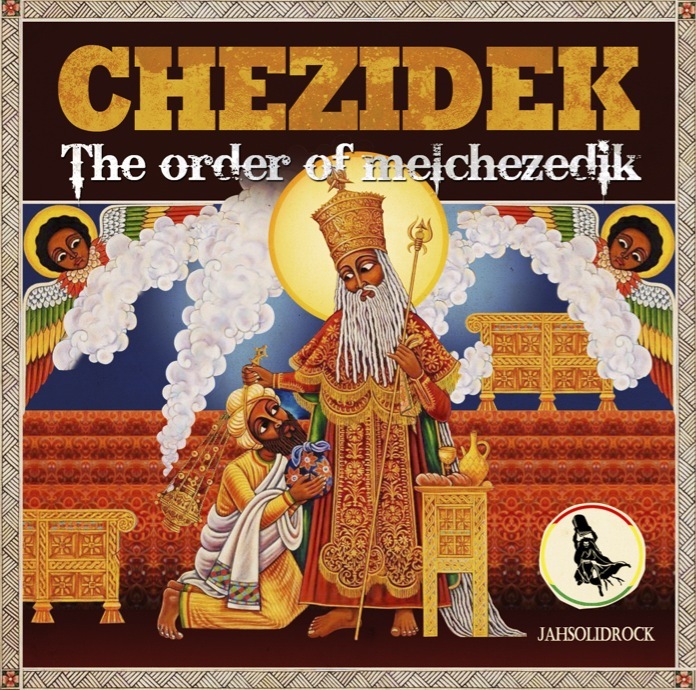 In April this year the same label dropped Chezidek’s new album The Order of Melchezedik, and needless to say – they put out another powerful set of Rasta anthems. 13 musicians and four lead singers were involved the making of this soulful album that could be cherished by youths and elders alike. One of the best UK reggae bands that reunited last year for the album On the Ground. This is the heavy dub version that contains some inspired mixing. Etana’s most cohesive yet and offers a soulful something for everyone. One of the leaders of the new generation of Jamaican conscious artists. This, his second album, is darker and heavier compared to his debut album The 7 Year Itch. Debut album from the conscious Jah9. Her jazzy and breezy voice floats over hard riddims produced by Rory from Stone Love. Probably one of the most consistent artists – in any genre – in the world. Lloyd Brown usually drops at least one album per year and the quality is remarkably high. Three years ago Jahsolidrock Music blessed the world with the brilliant and critically acclaimed album Judgement Time from Jamaican singer Chezidek, a set produced and recorded together with Dutch musicians Not Easy At All. Now Chezidek has returned with a new organic and original album on Jahsolid Rock. But Not Easy At All is not involved much this time. The riddim tracks are instead mainly provided by Austria’s House of Riddim, Dutch band The Skanking Monks and Ziggi Recado’s keyboard player Rekesh Dukaloo. And the result is very pleasant and highly enjoyable. Judgement Time was more or less presented in a showcase style, i.e. a vocal followed by a version. This is not the case with The Order of Melchezedik. It collects only two versions. The rest are vocal cuts. More of Chezidek’s highly individual, distinct and sometimes unbalanced high-pitched vocal style. But The Order of Melchezedik contains some of his finest moments as a singer and his pitch control is above his usual standard. There is not a dull moment on The Order of Melchezedik and the musicianship is first rate, particularly the horn section, the smooth guitar and the exquisite harmonies. This is definitely a set directly aimed at the best of the year lists. It’s currently exclusively sold via the label’s website, and will be available on CD and other digital platforms around 20 April. Pioneering deejay U Roy is sometimes labeled as the originator of the modern Jamaican deejay style and has been a vital force in reggae music since the late 60’s when he scored his first smash hits and held the three top spots on the Jamaican music chart with Wake the Town, Rule the Nation and Wear You to the Ball recorded over some of the late Duke Reid’s biggest rock steady cuts. He has recorded music for almost five decades, including working with Niney, Joe Gibbs, Tony Robinson, Tappa Zukie and Mad Professor. His two latest sets – Now released in 2001 and Rebel in Styylle put out in 2003 – have been combination albums, meaning U Roy joining forces with a singer on each track. 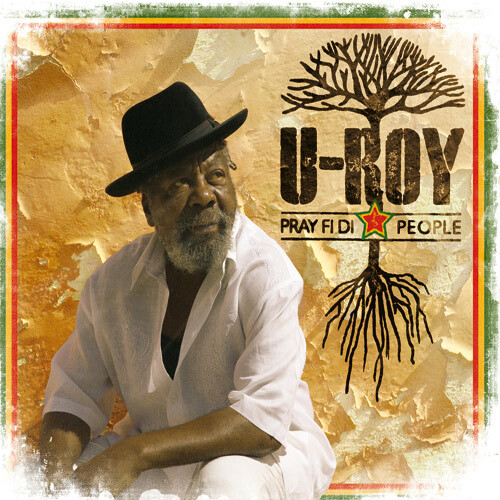 His brand new album Pray fi di People is in the same style, and has U Roy teaming up with Jamaican, African, American and European singers, including Marcia Griffiths, Horace Andy, Chezidek, Tiken Jah Fakoly and Harrison Stafford aka Professor from U.S. progressive reggae rockers Groundation. The album was produced by Bravo in Jamaica and collects 13 live played tracks over mostly refurbished vintage riddims, of which one is a cover version of Toots & The Maytals’ 70’s party starter Pomps and Pride. Tarrus Riley does a fine interpretation as Toots. Pray fi di People might be a bit ordinary and generic, and U Roy is a little less energetic compared to his previous work, but considering the man being 70 years old he certainly does an excellent job. And the album is at its best when he shares vocal duties with the dramatic voiced Professor and the sweet timbre of Horace Andy. Pray fi di People drops on French Soulbeats Records on Tuesday October 9 as CD and digital download. So, now it’s time for the best albums in 2010. And I think that it has been a rather good year. Much better than 2009. This year saw releases from several acclaimed Jamaican artists. Capleton dropped his first album in six years and Junior Kelly put out his first in five years. Both were for me a bit disappointing, especially the Capleton set that was way too soft. There were some major debut albums though, from the likes of Gappy Ranks, Mighty Howard, Romain Virgo and Toussaint. The above mentioned albums are mainly roots, and on the dancehall album front it has been very quiet for years, as dancehall still obviously relies on the singles market or one riddim albums. For me, the best albums in 2010 weren’t produced in Jamaica. They’ve been created in Europe or in the U.S. This shows that the trend continues – artists from Jamaica and music from overseas. In 2011 I’m hopeful about the new albums from veteran singer Alpheus and debutants Protoje and Mellow Baku. I also believe that Franz Job can produce a great follow-up to his wicked debut Babylon is Dead from last year. Below are the ten albums that I’ve enjoyed the most this year. Impressive debut from this 20 year old singing sensation. Watch out Beres Hammond and Sanchez. Maybe the best attempt to combine hip-hop and reggae ever. Showcase album produced by Roberto Sánchez. Earl Zero certainly still knows how to choose great riddims. Impressive second set in 2010. This harmony trio sounds like it did in its prime. It’s produced by Alborosie and Clifton “Specialist” Dillon. Sounds like Sly & Robbie in the early 80’s. Singer Toussaint shows how to combine reggae and soul. Showcase album with some wicked tunes. Only one drop riddims played with live instruments. Apple Gabriel is back with a blast. A very personal album with some very well crafted riddims. Also in showcase style. Frenchie has produced Luciano’s best album in the 21st century. Veteran singer that hopefully will continue to produce great music for many years. Not a dull or weak moment. A few months ago I had the opportunity to interview Chezidek after his performance at Swedish reggae festival Öland Roots. When asked why his songs about ganja are some of his best work, he answered that he gets very inspired when writing and singing about weed. And this seems to be true about several reggae artists when listening to the third installment of Greensleeves Ganja Anthems series, released late October, and just in time for the referendum on legalizing marijuana in California, USA. This 18 track compilation didn’t help the supporters of proposition 19, but it certainly help you to get into a great groove. The two former albums in the series largely focused on older ganja anthems from the likes of Mighty Diamonds, Eek-A-Mouse and the late Jacob Miller. Hi Grade Ganja Anthems vol. 3 is instead dedicated to recent releases, and the only tunes not released in the last couple of years are Bubbling Telephone (Chalice) from Charlie Chaplin and Herb fi Bun by Daddy Rings & Cocoa Tea. The rest of the tunes are probably familiar to those who have been listening to contemporary reggae, and include hit songs such as Acres from Capleton, Come Around by Collie Buddz and Sensi from Gyptian. The riddims are largely one drop and produced by a number of different producers; Frenchie, Augustus “Gussie” Clarke and Kemal “Flava” McGregor to name three. Even though the selection is great I miss two hugely herbaceous artists – Chezidek and Perfect. Those two have released several great weed tunes, and the compilation could have needed Chezidek’s Bun di Ganja and Perfect’s I Smoked a Spliff to be the ideal ganja compilation on contemporary reggae. Dutch-based label JahSolidRock is behind one of this year’s best releases – Judgement Time by Jamaican singer Chezidek. The album has an air of reggae from the 70’s and 80’s. And that’s what this label is all about according to the CEO. As many other reggae labels, the story behind JahSolidRock started with a sound system and two friends with a passion for music. Ras Denco – now CEO of the label – and singer Benaïssa Linger had a sound system in the late 80’s and early 90’s, named Umojah Ashanti. But something went wrong. Not between the friends but the music was changing, and not in a good way. At least according to Ras Denco. − We did the sound system thing for a couple of years with great fun and a lot of devotion, until the interest in roots music was changing toward dancehall and slackness. We could not find ourselves in that vibe of reggae, so we decided to put the sound system thing at a lower speed. It seems however that they couldn’t keep their hands off the reggae business. About three years ago they decided to start the JahSolidRock label and used their contacts with several of the Jamaican artists they had met during the sound system days. One of the first releases was Benaïssa’s sun drenched EP Voodoo/Coconut Water. − We hooked up with Silver Kamel records in New York and released Benaïssa’s debut album Tables Turn, which did pretty good worldwide. The album was a collection of songs that all had a positive message; some roots, some crossover. From that moment we continued recording and have done some more releases over the last years, writes Ras Denco in an e-mail to Reggaemani. The label’s biggest record so far is Chezidek’s acclaimed album Judgement Time that reached the streets earlier this year. Ras Denco explains some of the ingredients behind the success. − We put a lot of time and love in the album, and during the recordings in the studio with Chezidek there were also nice and positive vibes. We tried to keep that authentic roots reggae vibe from back in the days on the album; by using real musicians, real horns, real drums etc. And it’s a real album, a studio album, not a collection of lost songs from different producers. And that’s the mission for the label – taking reggae back to its roots in the 70’s and 80’s. Ras Denco believes the greatest and most creative reggae was produced during that period. − Musicians were important, and the artwork made in those days had something mystical about them. It’s exactly as David Rodigan said in an interview with you a few weeks ago – music coming from Jamaica does not make any sense anymore. It’s all hip-hop influenced, dancehall orientated and there is no more praising Jah. We try to go back to that foundation reggae sound, by working with great musicians, and people who still have love for reggae music. But producing roots reggae is often expensive, something that the producer Frenchie pointed out a few weeks back in an interview with Reggaemani. − It’s difficult to pay all musicians and production costs to make a great album, and still try to make profit out of it. But still we think that people will pay money for great productions. We prefer to make a ten tune showcase album with all ten tunes solid, than a 23 track album, where only two tracks will stand the test. I also believe the buying public want some value for a CD, Ras Denco explains. He writes that the label has some interesting albums lined up. All of them made with real musicians and with a great deal of love. − We’ve also just finished recording the new album from Apple Gabriel titled Teach Them Right, which will also hit the streets in October. It’s a special album, since it has been eleven years since Apple Gabriel did a solo album. We’ve also recorded a new album with Earl 16, and as we speak we are working on future projects with Chezidek, Brinsley Forde, and one of the most promising artists out of Jamaica – Zamunda. If all these releases are any way near the high standard of Judgment Time by Chezidek, I’m confident that my record collection and JahSolidRock will have a long and fruitful relationship. 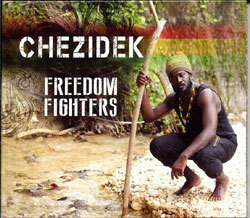 Chezidek is one of the top reggae artists and has recently released the acclaimed album Judgement Time. After his concert at Swedish reggae festival Öland Roots, Reggaemani had a chat with him about his new album and the reggae scene of today. Chezidek released his first album Harvest Time in 2002 and has since delivered several strong efforts. He has worked with producers from Jamaica, the U.S. and Europe. He has a unique delivery and fragile voice that may not suit everyone. But he has managed to become one of the brightest stars among the new generation of cultural singers and is currently in the forefront of the international reggae scene. I meet him about 20 minutes after his performance at Öland Roots. He is noticeably calm and in a cheery mood where he’s sitting backstage with a spliff in his hand. This is his third festival gig in Sweden. The first two were at the Uppsala Reggae Festival. − I remember the first time I was in Sweden. It was in 2005 at the festival in Uppsala. A very special occasion. I sat on my knees on the stage praying and suddenly rain came streaming down, says Chezidek philosophically and takes a puff. His last two albums were recorded in collaboration with European producers. At last year’s I Grade, he worked with Guillaume Bougard from France and on this year’s Judgement Time Dutch Not Easy At All Productions was behind the controls. Both records have been praised by critics around the world. − It’s a deep roots album and it’s very special for me. Easy and natural. He believes that his latest album is substantially different from its predecessors, especially Inna di Road from 2007. − Inna di Road was a serious album. I wanted to reach the people, to move and connect, he says and starts singing Dem A Fight We. Chezidek has also made several notable songs with French production team Irie Ites, including Bun di Ganja and Mr. Officer, a duet with Lorenzo. − Irie Ites take music back to the roots and they really love reggae. I’ve known them for a long time. I used to sing with Lorenzo when I met them in Jamaica in 2002. He followed them to Europe. I was supposed to come along, but stayed and recorded Harvest Time with producer Phillip “Fatis” Burrell, he says. Chezidek explains that Europe has better vibes than Jamaica and that is why he works extensively with European producers. In Jamaica, he says, it’s all about dancehall and hip-hop rhythms. − People want to hear the music, but no one plays it in Jamaica. It’s all about the negative sounds. Bad people claim the space and spread negative energy, while the good ones are in the dark. I’ve uploaded some photos from Swedish Öland Roots Festival on Flickr. All in all 14 photos of Stereo Steppers, Jah Ark Manifest, Club Killers, Fantan Mojah, Konshens, Jah Mason and Chezidek. The last day of Swedish Öland Roots Festival was darkened by lightning, thunder and heavy rain. But that didn’t stop the concerts and the audience could enjoy acts such as Chezidek, Zareb and Fantan Mojah. Chezidek is first out and enters the stage at 9pm supported by Denmark’s Roots Harmonics Band. 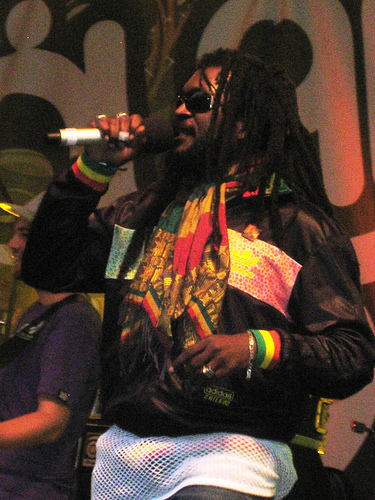 He trots onto the stage dressed in a black wind jacket, sunglasses, a rasta scarf and blue jeans. There’s a meagre crowd in front of the stage, most likely due to the weather. But Chezidek does his best to boost the crowd and delivers tunes from most of his almost a decade-long career. He performs a stripped-down version of his hit song Inna di Road and at the end of the Leave the Trees, does a brief imitation of the late Jacob Miller, which generates great applause. Chezidek has a delicate voice that cracks easily, and doesn’t hit all the notes – particularly the highest ones – perfectly. But this evening he uses his whole voice range and succeeds surprisingly well. The beginning of the show is a bit sleepy and dispassionate, but over the course of the concert Chezidek’s energy steadily increases, and by the end he skips and runs back and forth across the stage. Although he puts in a high gear for the two encores Bun di Ganja and Call Pon Dem, I have to say Chezidek’s performance was all in all too laid-back to ignite the Öland forest.